NWOBM legends Saxon have announced ‘Warriors of The Road’, a 38 date European Tour celebrating their 35th Anniversary. The set list will feature tracks from what is known to the fans as ‘The Holy Trinity’ – Saxon’s seminal albums Wheels of Steel, Strong Arm of the Law and Denim and Leather. Starting in Bristol and closing at London’s Shepherds Bush Empire, ‘Warriors of the Road’ will land in the UK on 30th November to delight fans with 12 explosive shows. ‘Come and see the awesome power of Saxon live!’ – says frontman Biff Byford. The band is currently working on a live DVD that will be released to coincide with the upcoming tour. 35 years, 20 albums, countless live shows and still no sign of slowing down: Saxon prove to be a force to be reckoned with and something every rock fan in the world should witness. Come see for yourself and take a dive into metal history. Ticket price for London is £27.50 (subject to booking fee) - all other shows £26 (subject to booking fee); please refer to www.Saxon747.com or www.Kililive.com (24 hour ticket line - 0844 871 8803) for more info. Tickets go onsale at 9.00am on Friday 18th April. 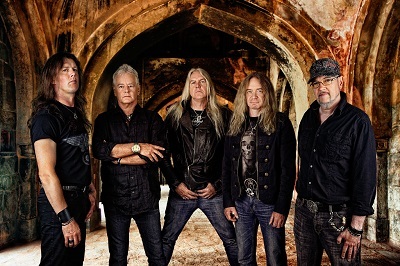 Saxon are: Biff Byford - vocals; Paul Quinn – guitar; Doug Scarratt – guitar; Nibbs Carter – bass and Nigel Glockler - drums. Saxon formed in Barnsley, Yorkshire in 1976. To date they have sold over 10 million albums worldwide and released 26 albums including Wheels of Steel, which hit number 5 in 1980. They have had 8 top 20 UK albums.